If you own an RV, then you must know that this type of vehicle requires winterization. Now, there are several ways to winterize an RV, but the safest way to do it is with RV antifreeze. If you’re not sure how to do this, don’t worry. We’ve prepared a complete guide on how to winterize an RV with antifreeze. Furthermore, we’ll also answer the most commonly asked questions regarding RV antifreeze, so by the time you’ve read our guide, you’ll be able to winterize your RV like a true pro! RV Antifreeze Ingredients: What is it Made of? How Does RV Antifreeze Work? What’s the Difference Between RV Antifreeze and Regular Antifreeze? How Much Antifreeze do I Need to Winterize My RV? How Much RV Antifreeze Should You Put in Holding Tanks? Can I Put RV Antifreeze in My Freshwater Tank? Do You Put RV Antifreeze in the Hot Water Tank? Will RV Antifreeze Hurt My Water Heater? What Does RV Antifreeze Smell Like? Where Should You Dispose of RV Antifreeze? Is RV Antifreeze Safe For Septic Systems? Can RV Antifreeze Go Bad (How Long Does it Last)? Can RV Antifreeze be Reused? Does RV Antifreeze Freeze (at What Temperature Does it Freeze)? Is RV Antifreeze Poisonous to Dogs? How Much Does a Gallon of RV Antifreeze Weigh? Is there a Drinkable Antifreeze? What Color is RV Antifreeze? How Much Does RV Antifreeze Cost? RVs are practically like small houses on wheels. They have toilets, drains, pipes, etc. During the winter, these water lines can easily freeze in the cold temperature. RV antifreeze primarily consists of propylene glycol, a biodegradable RV antifreeze. If you would like to keep your waterline from freezing in the cold weather, you should always winterize your RV with RV antifreeze. Antifreeze should be used throughout the year. However, you need to make sure to use antifreeze, especially in the winter, when the temperature is constantly at a freezing point. By winterizing your RV, you’ll keep the water system running smoothly all year round. Propylene glycol antifreeze is the best RV antifreeze for your vehicle. Since you’ll be using it on your water system, you need an antifreeze that’s non-toxic. Ethanol glycol antifreeze is highly toxic and should never be used in an RV. Propylene glycol antifreeze is sold at RV shops. It usually costs $5.00 – $6.00 per gallon. This type of antifreeze is non-toxic so it’s safe for all RV plumbing. It’s also not flammable and won’t damage your RV’s plumbing system. What’s even better, this type of antifreeze works as a kind of lubricant, and it will also help extend the life of all the seals in your toilets and faucets. For this reason, propylene glycol antifreeze is the best antifreeze to use for RV winterization. RV antifreeze is used to keep the water system in your RV from freezing and bursting. It works as a kind of lubricant that coats the pipes. If you buy a brand of antifreeze for your RV based solely on how cheap it is, you may end up with a big problem. Cheaper brands tend to expand and solidify, which puts an enormous amount of pressure on the pipes. When you’re buying antifreeze, you should check the label for brands that provide burst protection suitable for your region’s lowest temperatures. You’ll end up spending more money on the antifreeze, but you’ll save a whole lot of cash by preventing serious damage to your pipes. The biggest difference between RV antifreeze and regular antifreeze is that regular antifreeze is used on your car’s engine, whereas RV antifreeze is meant to be used on the plumbing system in your RV. The main ingredient in regular antifreeze is ethylene glycol, which is highly toxic. On the other hand, the main ingredient in RV antifreeze is propylene glycol, which is non-toxic. Since RV antifreeze is meant to be used on your RV’s water line, you need to make sure you use an antifreeze that doesn’t contain any toxic chemicals. Regular antifreeze is meant to fill up your car’s cooling system, and prevent your engine from corroding, and your engine’s coolant from freezing. Furthermore, it helps improve the heat transfer from the car’s engine to the coolant. Needless to say, you should never use regular antifreeze to winterize your RV. 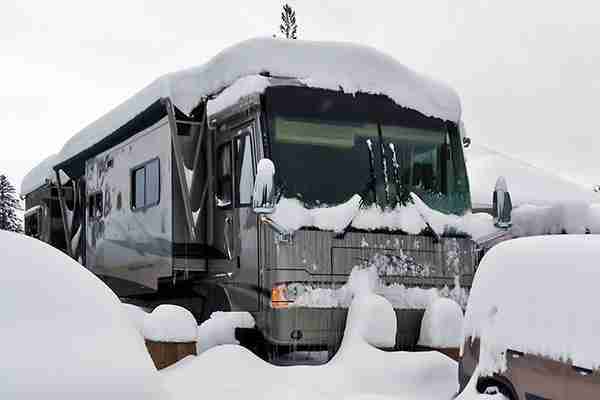 There are several steps required to properly winterize your RV. The first thing you need to do is to drain all the water from the fresh water holding tank by opening the petcock. Once you’ve done that, it’s time to move on to the black and gray holding tanks. Flush both tanks, and then clean them thoroughly. Next, open all the hot and cold water faucets until all the water is completely drained. The best way to check if it’s all gone is to flush your toilet a few times. In order to get rid of any water that’s left in the water lines, attach an air compressor to them. 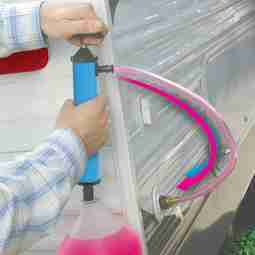 You can use a regular air compressor that you use to inflate your RV’s tires. Blowing out any remaining water will keep the antifreeze from diluting. Once you’ve finished, detach the air compressor, close all the faucets and the petcock, and replace the caps on all drains in your RV. First, disconnect the water line connecting the fresh water pump to the water tank, and attach the pump upstream of the water tank. Then, place the end of the water line that you previously disconnected into the RV antifreeze. Next, you need to turn on the fresh water pump so it can pull the antifreeze into the RV’s plumbing system. 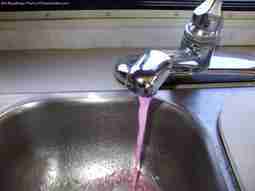 Let the hot water in your kitchen sink run until you can see the color of the antifreeze in the water. Once you’re done with the hot water, do the same with the cold water. When you’ve finished with the kitchen sink, move onto the shower, toilet, bathroom sink, etc. The amount of antifreeze you need in order to winterize your RV varies depending on the size of the vehicle, and the length of the water lines. Usually, two-three gallons of propylene glycol antifreeze is enough. However, if you’re not planning on bypassing for your water heater, you will need at least six extra gallons of antifreeze. You should put approximately two gallons of antifreeze in your RV’s holding tanks. However, this, of course, depends on the size of the tank. With a smaller tank, you may only need to use one gallon of the substance. Yes, you can put antifreeze in the freshwater tank. In fact, you should. The best way to winterize your freshwater tank is to screw a blow-out plug onto your water connection. Drain the tank, and then close all the faucets and drains. After that, connect a compressed air supply to the adapter with an air chuck. Next, open each faucet, one at a time, starting with the one closest to the pump. Keep the faucets open until there is no more water coming out. Once you’ve done that, put two gallons of RV antifreeze in the tank and then run the pump and open each faucet a little bit. You don’t need to put antifreeze in the hot water tank. However, if your RV doesn’t have a bypass system, you will end up using at least six additional gallons of antifreeze. No, RV antifreeze won’t hurt your water heater. RV antifreeze is specially designed for all the water systems, and it doesn’t contain any damaging chemicals. RV antifreeze has a smell and taste similar to maple syrup. Although it’s not overpowering, you can still taste and smell it if you don’t flush it out properly. In order to properly flush RV antifreeze, you need to hook a water hose to your garden tap, or if you are at a campground, to the city water tap, and connect the other end to your RV’s water intake connection. Then, open the gray tank and turn on all the faucets. You need to keep flushing the water until it looks and smells clean. If you can still taste and smell the antifreeze taste, you should add a box of baking soda to the drains. You can dissolve it and pour it down the drain, or just pour it directly and run the water. Unlike regular antifreeze, RV antifreeze is non-toxic. That means you can easily dispose of it in a septic system. Yes, RV antifreeze is completely safe for septic systems, since it’s a non-toxic substance. What’s more, it’s even biodegradable. First, you need to attach your RV’s city water inlet to the outlet hose of the pump. The pump intake hose then needs to go into your container of antifreeze. Next, you need to open all the water lines and start pumping until the antifreeze comes out through the faucets. Remember, do one faucet at a time. The water pump converter kit works just like a hand pump, except you won’t have to be doing all the pumping by hand. Instead, you just need to turn on the water pump to ingest the antifreeze into the system. Ultimately, using a water pump converter kit is much easier, and it gets the job done faster. Since you’ll be winterizing your RV every year, you should consider buying this kit, if you don’t already own one. If you can still taste and smell the antifreeze taste even after you’ve flushed out the antifreeze, you should add a box of baking soda to the drains. You can dissolve it and pour it down the drain, or just pour it directly and run the water. If you can still taste and smell the antifreeze after you’ve done this, you need to repeat the process any many times as possible, until the smell/taste is completely gone. As we mentioned, RV antifreeze isn’t dangerous when ingested, however, it’s not all too pleasant to drink. Basically, RV antifreeze doesn’t have an expiration date, which means it doesn’t go bad. You just need to remember to keep it in an airtight bottle so it doesn’t get contaminated. It’s best to keep it in the original packaging. Yes, RV antifreeze can be reused if you manage to seal it in an airtight container after you’ve run it through your water system. RV antifreeze usually doesn’t freeze until the temperature drops to -50. However, it depends on the brand. Basically, the more water that's mixed with it, the higher the temperature of freezing. Propylene glycol based RV antifreeze is non-toxic. It’s completely safe to dispose of it in a septic system. What’s more, RV antifreeze is completely drinkable. Since RV winterizing fluid is non-toxic, it’s not poisonous for dogs to ingest it. However, since dogs are more sensitive to certain substances, if your dog does ingest some RV antifreeze, you may want to take it in for some blood work, just in case. But there’s no need to panic, antifreeze for motorhomes is perfectly safe. Yes, antifreeze for RV water systems does eventually evaporate over time. However, it takes much longer for it to evaporate than water. One gallon of RV antifreeze weighs 128 fl. oz. The best natural antifreeze for RV’s is the one that contains propylene glycol. Yes, a drinkable RV antifreeze does exist. In fact, any RV antifreeze that contains propylene glycol is drinkable. However, it may cause side-effects similar to the ones you would have after drinking an alcoholic beverage. Any antifreeze that contains alcohol is flammable. However, propylene glycol-based antifreeze is not flammable. Read the label on the stained clothing to determine the hottest water safe for the fabric. Pour the hottest water safe for the fabric into a pitcher. Find a basin and lay down the shirt with the stain facing the bottom of the basin, and pour the water onto the clothing to flush the antifreeze out of the fabric. Use liquid laundry detergent to cover the stain. You can also use liquid dish soap or dissolved laundry powder. Use a clean white rag to rub the detergent into the stain. A colored rag may transfer the color, so be careful. Again, place the clothing on the basin, with the stain facing the bottom. Pour the hot water over the fabric. If the stain is still visible, apply oxygenated bleach to the stain, and rub it in. Leave it in for 15 minutes, and put it in the washing machine. Let it wash through a full cycle. Note: If you can still slightly see the stain even after washing the clothing in the washing machine, you will need to repeat the entire process again. Basically, you can repeat it as many times as it takes to get the stain completely out. Propylene glycol-based RV antifreeze usually costs $5.00 – $6.00 per gallon. However, it depends on the brand. RV antifreeze can be bought online, and at stores such as Home Depot and Walmart. However, the best place to buy RV antifreeze is at your local RV shop. Hopefully, after reading our complete guide to winterizing an RV, you now know everything there is to know about RV antifreeze. The bottom line is, RV antifreeze and regular antifreeze are two completely different types of antifreeze. You should never use regular antifreeze to winterize your RV, as it is a toxic substance. RV antifreeze, on the other hand, is completely non-toxic and is perfectly safe to use on all your RV’s water system. Remember, winterizing your RV every year is crucial and will keep your vehicle running smoothly for many decades to come. That's’ why you should go to your local RV shop and buy this amazing substance so you can enjoy your RV to the fullest!